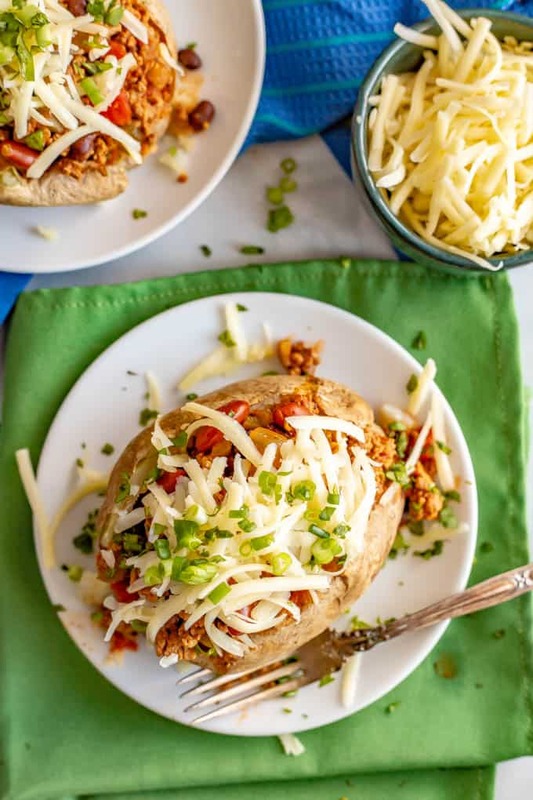 Loaded chili stuffed baked potatoes are the perfect way to use up leftover chili! Tender, fluffy potatoes are filled with warm chili and topped with all your favorite toppings. Sure to be a hit! Did you all enjoy the big game this past weekend? Did your team win? And more importantly, are you team chili or team pizza on Super Bowl Sunday? We were rooting for the Rams but weren’t super invested in the game, so it was really more of just a fun evening of watching football and eating good food. It was also a pretty low-key lazy day, since my husband and daughter were both under the weather. Tis the season for colds, right? But we had plenty of fun, and ALL the snacks too! And if you haven’t guessed, we are firmly a CHILI family when it comes to game day. I always make a huge batch but we can’t ever eat it all. And yes that’s on purpose because I love having leftover chili to reheat. You guys know I’m a HUGE potato lover, right? Slightly obsessed. So of course, stuffing a fluffy potato with some of my favorite chili was a no-brainer. And there are toppings galore, which always puts a recipe over the top in my book! 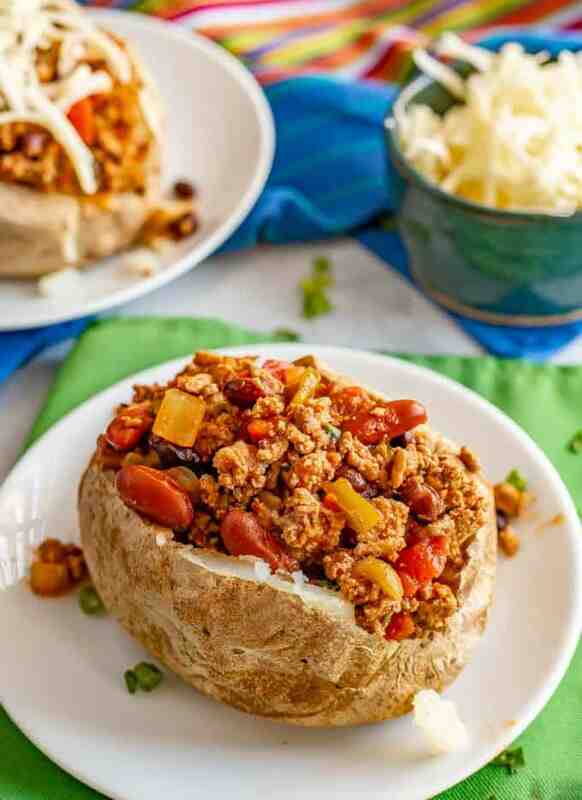 Tender, soft baked potatoes make a cozy little bowl for heaps of warm chili with all its spices and flavorings. 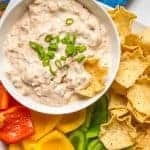 Then you add on plenty of cheese, sour cream, green onions and whatever else your little heart desires to top these off. You’re going to be hiding extra chili just to make this recipe! What chili should you use for these potatoes? I’m so glad you asked. Honestly though, you can make this with ANY kind of leftover chili, so use your favorite recipe. 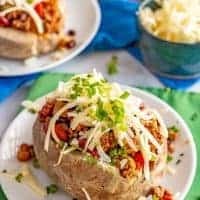 And if you don’t have leftovers, I won’t tell if you want to pick up a can of chili at the store and use that for these chili stuffed baked potatoes. They’re so good, you shouldn’t have to wait until you’ve got chili to spare! I prefer to do my “baked” potatoes in the microwave. It’s quick and easy and they’re done in about 15 minutes. Check out my instructions and how-to for easy microwave baked potatoes. You could also bake your potatoes in the oven. They’ll need about 45-55 minutes at 400. 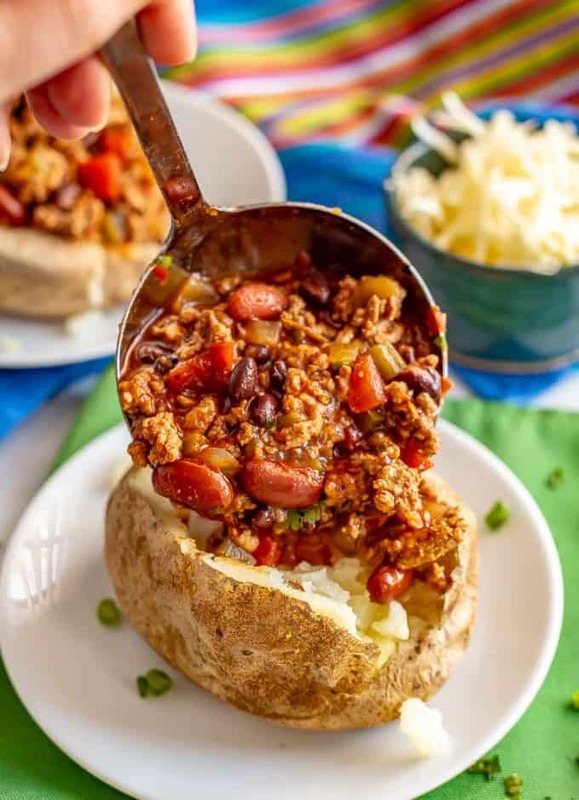 Rewarm your chili on the stove while you’re prepping your baked potatoes. This should take just 5-7 minutes over medium heat. Chili can thicken up as it sits, especially if it’s been in the fridge or freezer for a few days. If you need to thin it out, just add some low-sodium broth or even a few splashes of water to get it to the right consistency. On the other hand, don’t let it get too soupy. You definitely want a thicker chili to ladle onto your potato. 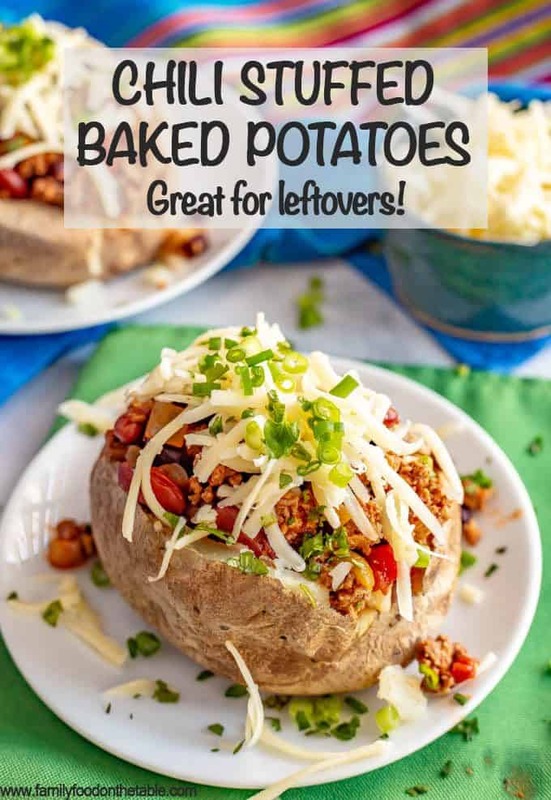 And just like with any chili served in a bowl, be sure to add your favorite toppings to these potatoes! I prefer to ladle hot chili into a hot baked potato and just add my toppings and dive in. 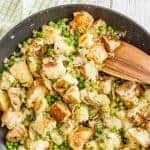 However, you could certainly add on your cheese and stick these potatoes back in the oven and broil them for a couple minutes to get the cheese extra melted on. Then add the remaining toppings and get ready to feast. The only dilemma you might face: fork or spoon?! 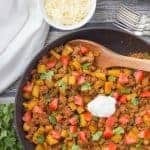 I opt for fork because I love a thick chili and I love scraping out the fluffy potato bits with each bite of chili. But you could go team spoon if you’d rather. 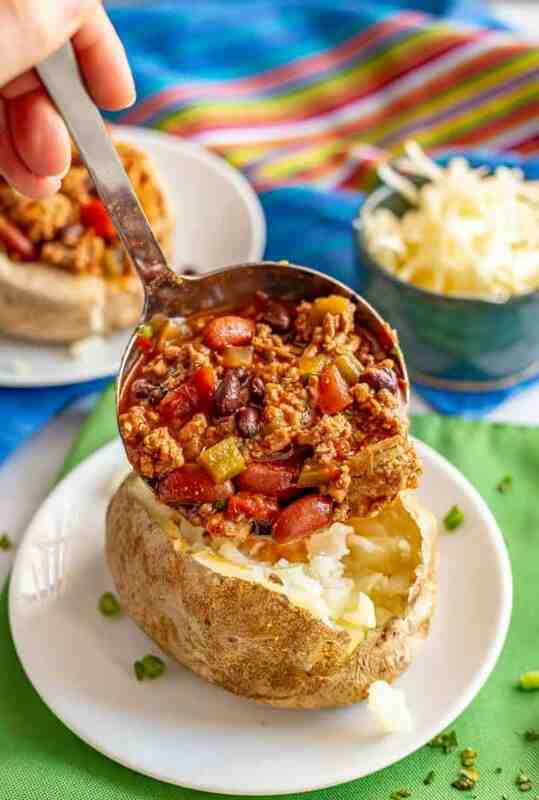 Any way you top this, any way you eat it, I think you are going to love having your chili in a baked potato bowl! 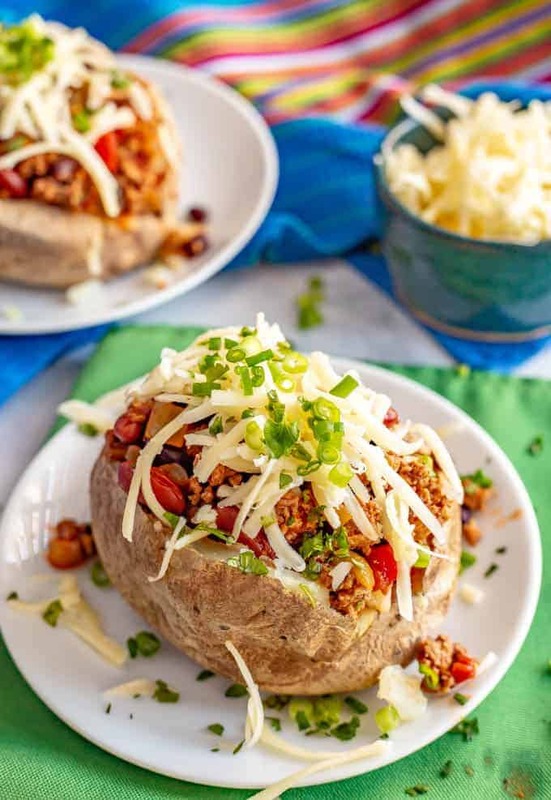 Loaded chili stuffed baked potatoes are the perfect way to use up leftover chili! Tender, fluffy potatoes are filled with warm chili and finished with your favorite toppings. Shredded cheese, sliced avocado, sour cream or Greek yogurt, chopped fresh cilantro, sliced green onions, pickled jalapeños or pickled red onions, hot sauce or sriracha, etc. Meanwhile, reheat your chili in a pot on the stove over medium heat, until warmed through. Cut a slit across the top of each potato and fluff the insides with a fork, pulling the potato away from the sides. Season the potatoes lightly with salt and pepper. Add a heaping cup of warmed chili to each potato. Serve hot, loaded up with desired toppings, and enjoy! I prefer to do my “baked” potatoes in the microwave. It’s quick and easy and they’re done in about 15 minutes. 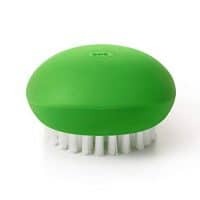 Check out my instructions and how-to. Chili can thicken up as it sits, especially if it’s been in the fridge or freezer for a few days. If you need to thin it out, just add some low-sodium broth or even a few splashes of water to get it to the right consistency. Just don't let it get too watery - you want a thicker chili to scoop onto your potato.